Back in the 80's the Filipino community in Australia was high on imported Filipino talents. Pilita, Reycard duet, Willie Nepomuceno and many more came to visit us. It was a period before FaceBook and text messaging, when people eyeballed (met eye-to-eye) to get updated with gossip and business deals. Email at that time referred to a company in Australia that manufactured white goods. 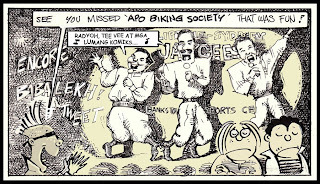 Pinoys often went out at night to have fun (e.g. Manila Disco at Kings Cross) or play poker machines in RSL clubs after dining at Intramuros, Lambat or that chinoy Vicente's Philippine Restaurant at Elizabeth St near the Philippine Consulate. Sometimes these nocturnal trysts ended up with adult Leggo parties (aka mahjong, what else? :).The Pinoy community became a beggar for fun due to rarity of traditional Manila "gimmicks". 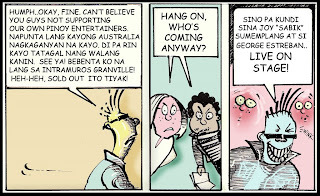 Homesickness assaulted the psyche of Sydney Pinoys and so alert producers went all out to bring in entertainment. Why I even joined the fray, aesthetically-speaking, for I designed a few stage sets for them and sometimes drew caricatures of talents then projected onto big screens. 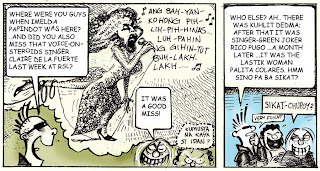 "Radyo, TV at mga lumang komiks, wala nang ibang mapaglibangan..." goes the classic song by APO Hiking Society (Pumapatak Na Naman ang Ulan; translation: here comes the rain again..yet the Eurythmics wasn't born yet). No doubt concert tickets were sold out as the thirst for adrenaline was sated by imported Pinoy talents. 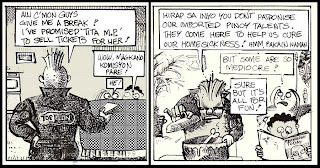 Back then I drew comics for some local Filipino-Australian newspapers. Here's one I did in 1985. I love doing comics. 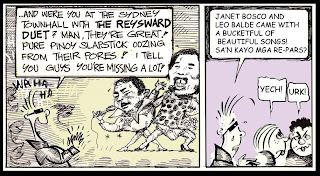 It was another branch of expression for me to tell stories about life in Sydney where I often lampooned entertainment events. Not sure if these images were included in my early Jep book published that same year for I can't find my last copy of Jep, Ang Pinoy sa Ostrelya! Am thinking of reprinting and include many other unpublished Jep material. The original drawings were scanned and saved digitally (before they deteriorated like ancient papyrus). In PhotoShop images were cleaned and tinted with light colours. I'd have them printed in colour but black and white printing is cheaper. Now our monitors and home printers don't care much about colours or neutral grey. I also retyped some handwritten script using Comics Sans font. During a recession people don't want to spend, so naturally they go back to basics including inexpensive fun. 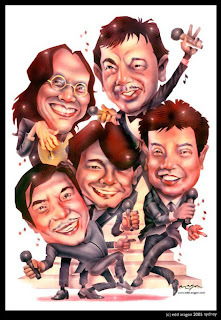 Some of my Jep characters might snort upon Pinoy entertainers like these guys in this video (below) but then we're all homesick for the 70's! ;-) Might as well enjoy life of a meat today and sandwich it between top half bread of tomorrow and bottom half of the past. Enjoy our recession-hit pan de sal sandwich.